Texas Freckles: Just checking in. I've been so busy this week. I finally finished up the work my client needs for a meeting next week. With that off my shoulders, we've been focused on shopping, organizing, and packing for Shea's first week at sleep away camp next week. It will be the first time she's been away from home for so long and she's even crossing state lines! I'm actually pretty jealous because she'll be in the mountains where the temperature is in the 50's at night. After getting buckets of rain last week, our daytime temperature is back over 100° and the heat index was 109° yesterday. Yuck. I don't have much to share today, but I did re-upholster my desk chair last Saturday. I'm really enjoying that fun Ikea fabric on my chair. I have one more parsons chair and just enough fabric to re-upholster it also. I'm going to have to get a new staple gun before I do any more upholstery. I don't think I've ever had a staple gun that worked properly. Sean says he can get me one to use with the air compressor. I like that idea. I still don't have the Spoonflower fabric yet, but I wanted to thank you all again for the kind comments. I'm working on completing the repeats of the designs I drew for the cheater fabric (not just scaling them up) so that I can do a yard of 5" charm squares. I'm anxious to get it done and uploaded! I talked Shea into making a quilt top. I've got four cousins who are expecting, so she used some Tweet Tweet to make a little baby quilt. I didn't give her much help because it was an attempt on my part to keep her busy for a while so I could get some work done. When she finishes sewing the top, I'll do the quilting. The house is finally coming along after some huge delays due to all the rain over the last couple of weeks. The rough-in inspections are done (framing, electrical, low-voltage, HVAC, plumbing, gas, etc. ), so the insulation, sheetrock, and brick can begin next week. Shea enjoyed climbing around in Sean's Bobcat thingy he uses to dig and tear stuff up. 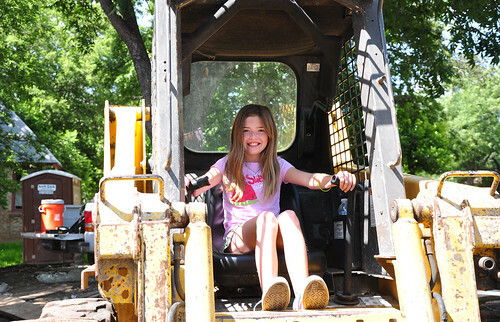 (I think it's actually called a skid loader. Impressed?) He was digging the trench for the new water line. I've had a number of inquires about the progress bars I use for tracking my hexagon quilt progress. Here's the link to the progress bars I'm using over there near the top right. You have to do your own math with these, but I liked that they were small and customizable. Have fun! 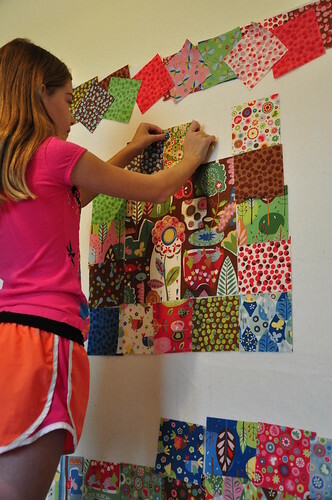 I'm hoping to head to Dallas tomorrow for another Dallas Modern Quilt Guild Saturday Sew after we see our girl off for camp tomorrow morning. I'm ready for a break and the Saturday Sew sounds like a great way to end a very busy week. I agree with your comment on staple guns! My hand always aches afterward & I end up having to hammer them in the reat of the way! But your chair looks great! Love the print! Charm squares to go with your cheater cloth?! Definitely can't wait to get some of those too! Love your newly covered chair. So cheerful. I have to admit, those Bobcats are quite fun to drive! I love that chair. Thank you so much for the link for the hex progress. I am so looking forward to your Spoonflower fabric! Funny, I have the same fabric you used for your chair as curtains in my eggplant purple laundry room (yes, it's a crazy room). Love how the chair turned out! 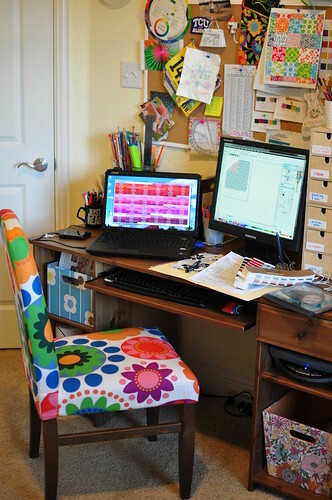 love the chair...and can't wait for your spoonflower fabric! That chair is rockin'! Awesome fabric. Can't wait for those charms!!! That's the same Ikea fabric I made my sewing machine cover out of! We match! Okay, love the chair...well done! The fabric is so cheery and it looks like a professional did it.